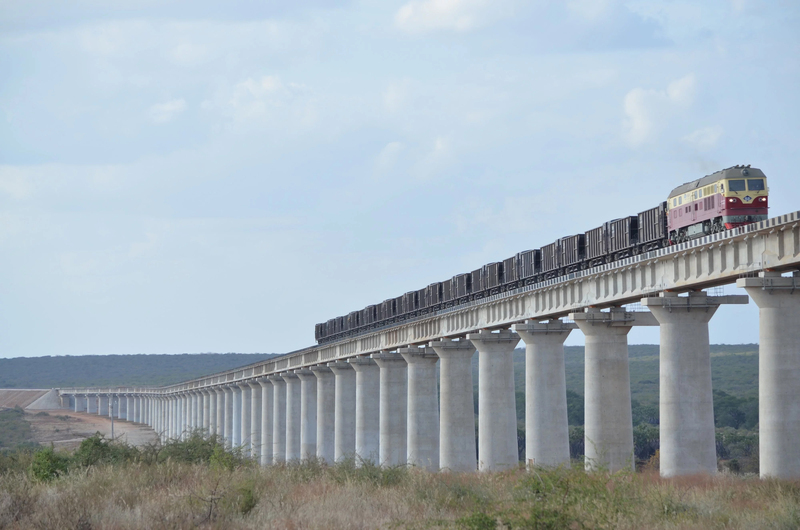 Less than 4 per cent of the cargo transported along the Northern Corridor relies on rail transport. The rail network essentially comprises a single line, overland rail track from Mombasa through Nairobi, Nakuru, Kisumu/Eldoret, Jinja, and Kampala to Kasese in western Uganda (1650 km). The Northern Corridor Transit and Transport Coordination Authority (NCTTCA) continues advocating for improvement of existing meter gauge lines and development of the Standard Gauge Railway (SGR) for all Northern Corridor Member States. Kenya and Uganda had undertaken to rehabilitate sections of the meter gauge railway network. However, some of these rehabilitation projects were overtaken by the commissioning of the Standard Gauge Railway. The NC Member States of Kenya, Uganda, Rwanda, South Sudan and DR Congo have committed and planned jointly to develop a SGR. The development of a high capacity Standard Gauge Railway transport system for both freight and passengers is one of the notable achievements in enhancing the Rail Network. In this regards, the Government of the Republic of Kenya has identified two phases for the development of SGR. The railway line starts at the Port city of Mombasa on the shores of the Indian Ocean and runs along the Northern Corridor through Nairobi, Kisumu to Malaba. The first phase of the Standard Gauge Railaway line traverses Kwale, Taita Taveta, Makueni, Machakos and Kajiado from Mombasa and culminates in Nairobi. The second phase will traverse Naivasha, Narok, Bomet, Nyamira, Kisumu, Yala, Mumias to Malaba. In 2014, Uganda has commissioned the construction of the first phase of the SGR and harmonized with DR Congo subsequent interconnections to extend the SGR up to Kisangani. In Rwanda, the signing of a MoU for the Mirama Hills – Kigali route was in the process. Discussions with Uganda on harmonization were underway. The Bankable Preliminary design was awaiting the conclusion of the addendum to the contract the same consultant has with Uganda. The Bankable Feasibility study for South Sudan was ongoing and was expected to be completed by 2016. Phase 1: Mombasa – Nairobi (472 Km) Construction stage: 75% complete; completion in June 2017. Phase 2A: Nairobi – Naivasha (120 Km): Financial Contract was signed on 03-12-2015. Phase 2B: Naivasha - Kisumu (including provision of locomotives and rolling stock and branch line to new Kisumu Port (262 Km): Commercial Contract was signed on 24-March 2016. Phase 2C: Kisumu – Malaba (107 Km): Commercial Contract was also signed on 24-March 2116.